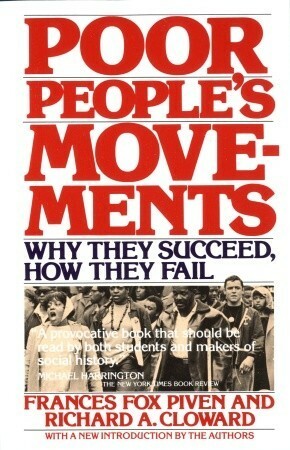 Poor People’s Movements: Why They Succeed, How They Fail (1978) by Piven and Cloward has become a classic of social movement theory, and one I find quite fascinating even though I disagree with almost all of it. I read this years ago as an organiser and remember being both impressed, and a little struck by their lack of generosity to people in the movement. What I love is that these are engaged scholars, part of the struggle for change — to the extent that they became known as communists and radical figures to the national press. They are also firm in where they stand — with the poor and the vulnerable and the dispossessed. They try and write from a position of respect and understanding for people’s daily lives, and in some ways they have tried to create a radical theoretical framework that is responsive to how things have actually played out. Yet in other ways, their framework is astoundingly rigid, and I would argue brittle. It ignores how histories and traditions of struggle are preserved and passed down, particularly among the oppressed. Where we agree? Organizers do not create the conditions for mass movements. Piven and Cloward go on to argue that when these conditions are right, possibilities for change may be limited but the impetus of mass movement needs to be pushed forward as quickly and as far as possible to obtain what gains are possible. I agree with that, and also that social movement organizations can sometimes act as an unwelcome break on people’s demands. But that this obliterates the need for organization at all? That such mass movements spring up from nothing and take their direction only from the objective circumstances of that particular capitalist moment? No. I think Aldon Morris’s detailed work on the Civil Rights Movement shows just how important organization can be, particularly those that facilitate critical thinking and preserve historical memory that can be respectfully passed along to new leaders without dampening their creativity or innovation. Freire and Horton, as well as my own experience, point to how the practice of working collectively, direct democracy, research and strategy are all learned skills, and without them things fall apart pretty fast. But I’ll come back to them in later posts. But whatever their overarching ideology, activists have concentrated their efforts on developing formally structured organizations with a mass membership drawn from the lower classes. What underlies such efforts is the conviction that formal organization is a vehicle of power. The question is how to ensure that this blunting of force, weakening of demands, and calcification or bureaucratization of organisations does not happen — and I think here that this is also where key figures play a role, who do not necessarily remain with one group but remain involved in the movement. People can be wise and giving rather than autocratic and smothering, and key people reappear over and over again, though generally in the background. I utterly disagree with the bit about ‘the forms it must take’, just as I would about demands and organisation. These are what emerge from local culture and histories of oppression and resistance, from the beliefs and practices of key organisations, from the supporting infrastructures in place to help grow movement or whose absence ensures it remains fragmented. The militant nonviolence of the civil rights movement was nothing natural or spontaneous, as Morris and Cobb show so convincingly. I think attention was diverted this way, but for ideological reasons and not really as a result of definitions. I like thinking about the complexity of protest, but that’s not what they’re doing here. The emergence of a protest movement entails a transformation both of consciousness and behavior. They argue it has 3 distinct aspects, which are interesting to think about, though Morris challenges these as well. masses of the poor were somehow able, if only briefly, to overcome the shame bred by a culture which blames them for their plight; somehow they were able to break the bonds of conformity enforced by work, by family, but community, by every strand of institutional life; somehow they were able to overcome the fears induced by police, by militia, by company guards. The emergence of popular uprisings reflects profound changes in the larger society. I really hate the use of the term ‘socially determined opportunity’. It’s like they jettisoned some of the Leninist dogma but kept some of the bits of Marxism I hate most, while losing the more flexible dialectic that I love. What do they argue are characteristic of these times of opportunity? Economic and structural change is not enough to explain it, because that’s a usual rather than extraordinary state of affairs under capitalism (I do like that point), nor is it just when social institutions break down, but when both happen together. And I do like the point that people have to believe their actions can achieve something, and the times when apathy can reasonably become hope are also rare. Concrete conditions determine the time and shape of movement. Not intellectuals or practitioners. This is basic to organising, right? You start where people are…but you sure don’t have to stay there. You collectively ask some questions, find some answers, craft strategy. Defiance can choose a number of targets, strategies, conditions, goals. The kinds of response you get — and this assumes that government is the target, which I suppose in mass movement terms it usually is. Off course, much depends then on the political moment — who is in power, who their main constituency is, and yes, often the point in the electoral cycle is important, but always? Organizers and leaders cannot prevent the ebbing of protest, nor the erosion of whatever influence protest yielded the lower class. they can only try to win whatever can be won while it can be won. So win what you can before it all slips away and you just have to sit around waiting for the next wave? On to the case studies in the next post because this is already stupidly long. The “reality” espoused in the mainstream of society is but one reality: a privileged reality that excludes or represses many others. Rejecting their exclusion or repression, the insurgent realities of social movement organizations challenge mainstream reality and seek to establish new and better ways of life. 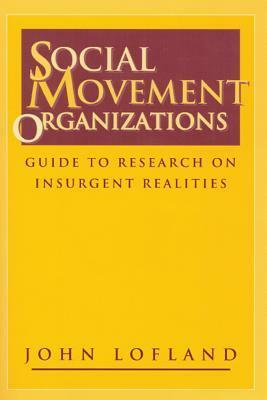 In this guide I explain (1) how social scientists go about studying social movement organizations — their research procedures — and (2) what investigators have learned about these insurgent realities in the form of generalizations or propositions that answer key questions. This is a curious book, good I think for teaching, as one way to get students to think through all the different ways they can study an organization working to change the world. It simplifies a lot of the complexities of things in a decent introductory way. It hits all the right areas of work and strategy I think (from a practitioners point of view it seems exhaustive and quite common-sensical, a good sign I suppose), but it pursues a level of abstraction, however, that I found quite difficult, and that in many ways detracted from its usefulness in actually thinking about social movement rather than just dissecting it. This is a process of reality-making, and I like that he notes there is another side of it, which is reality-excluding, and this is where SMOs work. They fall along a scale of resistance from atomised and covert individual acts of resistance to bandits and gangs to individual crusades to the organisation to the social movement. “mainstream” and “marginal/excluded” realities are about these disparities in wealth, power, prestige, and organization. I like that in looking at different structures he notes the existence of ‘front organization[s]’, groups formed by a radical organization to work on a particular issue of their platform — I never really met anyone in one until I moved to the UK. I also, of course, enjoyed seeing the movement halfway house, that concept I so love from Aldon D. Morris, who gets more than one mention here. Whereas the ideal state of pluralism demands many such cross-cutting ties. I found the idea of “micro mobilization contexts” interesting as well, though I am not at all sure what I think of McCarthy & Zald’s theory. These contexts, they argue, rest on four variables: Leadership Availability, Communication Networks & Similar Resources, Network Integration, Situational Availability. To explore further later, but I do think that key to everything is a group that believes its struggle is necessary and victory is possible. I almost laughed out loud at this category of things that SMOs do — ‘Staid, Conventional Activities‘ (272). They may be fighting for insurgent reality, but they do some of the boring things mainstream groups do too. On this list?